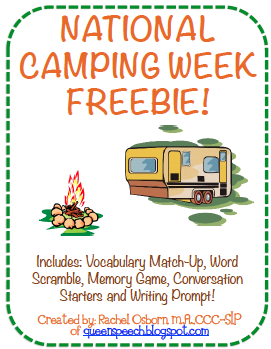 National Camping Week- Language Freebie! The 4th Week of June is NATIONAL CAMPING WEEK! To celebrate I have made a Language Based Freebie for my Facebook Fans! This is a forever freebie! Thank you for all your support and being a FAN on Facebook! Hi Rachael -- anyway we can get this great camping freebie if we're not on FB? ?